The SG Table Football Premier League 2014 officially kicked off today (12 Jan 2014)! Matches were played at the Aranda Lounge , Orchid Country Club Singapore! The turn out for the 1st session was very good, with 16 of the 20 players playing. The 1st match of the season, between Vikas and Nic ended in a stalemate, but that all changed right after, where the goals started to flow and the games got more exciting. There were a couple of upsets and surprises, nail biting draws and also games with high scores. 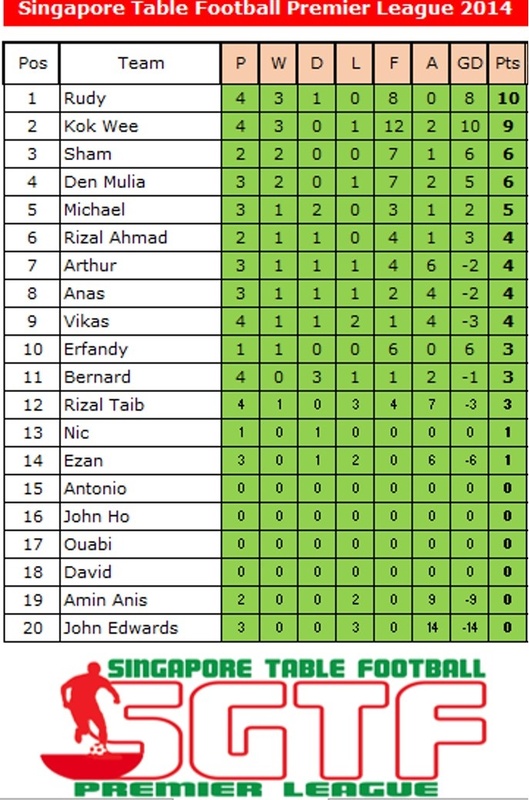 In a nutshell, it was a very eventful and successful 1st Session of the SG Table Football Premier League 2014. The 1st session of the SGTF Premier League 2014 ended with Rudy topping the table with 3 wins, including one over last year’s Champion, and a draw. He is closely followed by Kok Wee, who managed 3 wins as well, but not after a surprise 2-1 defeat in his season opener. But its still very early in the season and changes are expected in the table as the season progresses. The next session is scheduled to happen on 09 Feb 2014. So do drop by Aranda Lounge at Orchid Country Club for another day of exciting Table Football action!